I don’t remember the first time I saw aurora borealis. In fact, it seems that my memories of specific aurora displays are pretty sketchy as a rule. What I do remember is how they make me feel. I remember seeing them, half a lifetime ago, walking to Inuksuk High School in Iqaluit for an evening music class. The lights were so bright and active I had to stop and watch, even if it made me late. It was quiet around me, not a soul to be seen, and I was sure I could hear a faraway tinkling and crackling. It was just me and the sky and the frosty air and it was absolutely magical. Far and away the best northern lights I ever saw was on a 9-hour drive that Michael and I took, travelling from Yellowknife back to our home in Fort Liard. It was early November, I think, and chilly, but the lights were so spectacular we had to stop driving and get out, resting against the car, snuggled together for warmth. The aurora rippled across the sky faster than sweeping searchlights, and they burned not only green, but scarlet, too. It was awesome in the truest and most reverent sense of the word. Since moving to Whitehorse, the only time I remember seeing northern lights worth any mention was during a drive home from Atlin back when I was pregnant with Jade. Our friend Lara was visiting and we’d spent the day hiking Monarch Mountain and exploring Atlin. On the way home we were forced to stop driving because the aurora were so distracting, we simply had to pause and enjoy them. I was so pleased that Lara had the opportunity to see such a quintessentially northern phenomenon during her visit, and I was delighted to be sharing it with her. Aurora borealis, we are told, are caused by “solar wind”, which evidently has an eleven-year cycle. These past few years have coincided with a low point in the cycle, so sightings of northern lights are less frequent and less spectacular. That’s why last night, when someone posted on Facebook, “Quick! Go outside! Northern lights!” Michael and I sprang into our boots and scurried out into the night. At first all we could see was a dim band of green low in the sky to the north, but it had been so long since I’d seen northern lights, I wanted to watch them for a while, even if they weren’t spectacular. The dim ribbon slowly lifted higher, brightening as it ascended. And then the rippling started. At times streaks of pale green shot upward, reminding me of footlights in a theatre; at others, they would “wave” across the sky, like a diaphanous curtain blowing in a summer breeze. The night sky was beautifully clear, with sparkling stars punctuating the darkness between the veils of northern lights. I was caught up in their spell again, in the wonder and admiration and simple enjoyment of witnessing something beautiful. Magic. They have been AMAZING here in Yellowknife lately. Möchte ich auch einmal sehen! Aber das wird in diesem Leben nichts mehr. Dafür habe ich allerdings “weisse Nächte”in St. Petersburg gesehen und auf der Schiffstour zurück nach Schweden. Hier sehe ich seit Wochen NUR Schnee. Aber auch dafür würden mich viele Menschen beneiden. I always saw them growing up in Sask and love them too! Awestruck is what I always was. 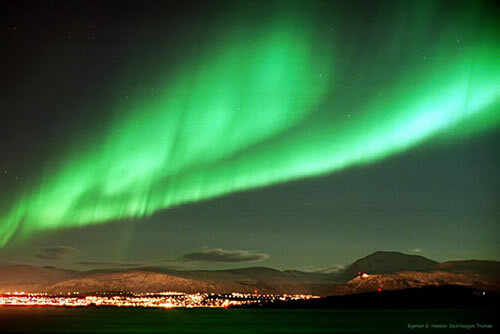 It is on my list of Top 10 things that I must do before I die: see the NOrthern Lights. I can’t even explain the need, but I HAVE to see them. I have been to Alaska enough times that it SHOULD have happened, but, obviously, I can’t WILL them to be on display just because I happen to be there. So, no luck yet. But I LOVE the thought of seeing them. I’m happy to hear that they are just as AWE-some as I expect them to be. Enjoy them for those of us who aren’t that lucky. Gorgeous. The post and the vision. I saw them once on a transatlantic flight. The captain came on late into the flight and whispered, “if there’s anyone awake right now, there’s a good display of the Northern Lights out the window.” It was spectacular — like dancing bars of bright pink and neon green. I will never forget it. Thanks for the reminder of such a magical moment. Stopping to read this post even if it made me late for the next task. Thank you. Reading your post (blog) gives me a good feeling, too.